Facilities and services include restaurant, bar, coffee shop, swimming pool, wireless Internet access, elevator, parking, gym, tennis court, gift shop, meeting/conference room and 24-hour reception. Rooms feature minibar, tea/coffee maker, air conditioning, heating, wireless Internet access, safe, TV, telephone, hairdryer and bathroom. Junior suites feature living area. ** Please note that some of the above facilities may be closed due to weather / seasonal conditions. ** Address: King Hussein Street, 77110 Aqaba, Jordan. 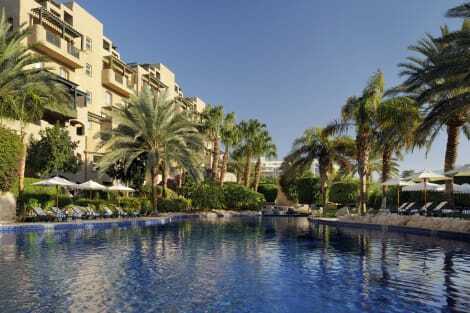 Location and Overview - Stay at the Mövenpick Aqaba Jordan for a truly unforgettable experience. Perched along one of the most vibrant stretches of the Aqaba shoreline views of the Red Sea or mountains make this a home from home for all of our guests. Choose from one of 297 rooms including 87 suites and apartments, all offering a luxurious and comfortable stay. Rooms and Apartments - Contemporary design and neutral tones give the rooms a modern feel and flashes of colour influenced by the sky, sea and surrounding land are pleasing to the eye. All of our rooms and suites come equipped with the modern amenities one would expect for a trip of a lifetime. 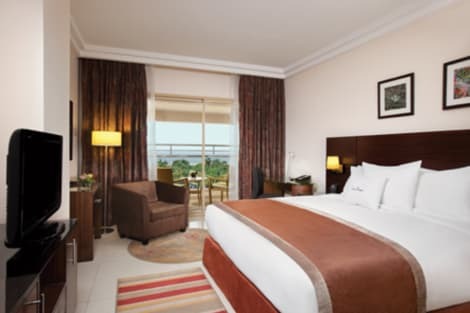 Restaurants and Bars - The Mövenpick Resort & Residence Aqaba has 8 restaurants and bars to choose from offering a range of international cuisine. Our largest is Palm Court Restaurant which offers all day dining with over 220 seats including outdoor terrace dining. Open from 6.30 am until 10.30 pm daily, the outlet offers à la carte dining and features sumptuous buffet set-ups for breakfast, lunch and dinner. Sports and Leisure - Although Aqaba has an endless array of activities, the resort offers additional facilities on its own premises. These include our on-site gym to help keep you in top shape, as well as Jacuzzis installed in two locations, a sauna and a whirlpool, all available for ladies and gentlemen separately. The resort’s four swimming pools are guaranteed to keep you cool in the hot temperatures. Enjoy the unique beauty and colours of the Red Sea through excursions to nearby scuba diving and snorkelling. Meeting and Events - Offering a choice of three function rooms accommodating up to 550 persons, professional planning and impeccable service, Movenpick Resort & Residences Aqaba is the perfect venue for wedding, conference, meeting, banquet and private gatherings. All function rooms feature the latest audio-visual equipment and wireless LAN and careful attention is paid to even the smallest detail. Enjoy international cuisine at Azure, a restaurant where you can take in the pool view, or stay in and take advantage of the 24-hour room service. Wrap up your day with a drink at the bar/lounge. Breakfast is available for a fee.